Join us for interactive curation to celebrate the way of life and help fundraise for Sutikalh & Ulluilsc! We are inviting artists to create pieces for this event or donate work already created! Some of the displays telling the stories of Ulluilsc & Sutikalh will also be silent auction items! 8:00 Spiritual Warriors (formally known as Kalan Wi) hailing from Lil’wat, St’át’imc Nation. Entrance by donation (No one will be turned away for lack of funds). No Alcohol or Drugs are permitted! Main entrances has stairs, for people with mobility issues please call 604-396-9893 and we can let you in a different entrance. We are also seeking endorsement from different organizations, if your group would like to endorse this event please let us know. 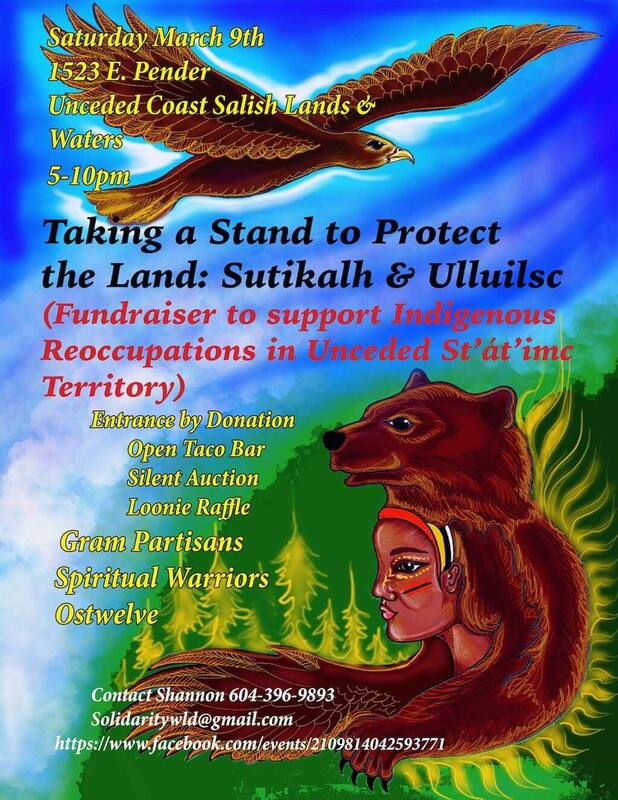 The organizers would like to acknowledge the previous and ongoing support from so many groups & individuals for Ulluilsc & Sutikalh and their stand to protect the land in unceded St’át’imc Territory. We are grateful for all contributions, whether labor, food and auction items, or financial donation. Kukwtsumckal’ap! Thank you Everyone! “The women directed the men to go into the mountain to find a place to set up a camp where it could be protected from. It was the women that set the tobacco into the fire to make it sacred as we asked for protection and strength to protect the mountain from the likes of Nancy Greene Raine, to protect it for future generations to use for berry picking, picking medicines, and using it spiritually. Sutikalh means Winter Spirit because this is where St’at’imc sought guidance spiritually, they fasted from anyway two days to whatever they chose. some stayed in the mountain for up to two years. there are signs in the mountain of their presence were there” Elder Rosalin Sam Lil’wat, St’át’imc Nation. Doug is an elder who lives there most of the time alongside Hubie who lives there year round at the foot of the mountain to protect the animals, plants and water for future generations. Often dealing with harassment from locals who wish to not see them there. They pack water and clean up the forest daily to have firewood for warmth, cooking and the sacred fire that has been burning for 18 years. March 16th 2018 marked Ulluilsc’s 3rd anniversary. This village has been set up by Christine Jack, a St’át’imc spiritual leader as a response to the ill logging practices of Aspen Planers. This company has knowingly desecrated an old village site and clear cut without consent. “gathering place”describing the rich cultural heritage of the area. Since time immemorial, the St’át’imc, Secwepemc & Tsilhqot’in have occupied the respected lands, to gather, hunt, harvest, trade and carry out social and political meetings. In the last 3 years Ulluilsc has been blossoming into a small community of St’át’imc people returning to the land to live off reserve, along with supporters from all four directions. To get to Ulluilsc: Drive through Lillooet, BC, turn left onto Moha road and follow the highway signs that say “Seaton portage, Shalath, Goldbridge” keep on that road for about 28 km then you will see a stop sign on your right with a street sign that says Yalakom rd. follow this road and the little yellow km markers until you are just past the 50 km mark. Then you will drive for one more minute and you will see the camp there on your right-hand side! You cannot miss it! To get to Sutikalh from Vancouver take Hwy 99 come past Pemberton and Mt. Curry drive 4km past Duffy Lake. There is a foot bridge to the left, if you are going too fast you will miss it. The address is written on the bottom of the foot bridge 5043 Duffy Lake Rd. There are working dogs that protect the settlement at all times. Two different stands being made to protect unceded and unsurrenderd St’át’imc lands and waters from destructive developments that do not have consent from the St’át’imc people as a whole. Both Sutikalh and Ulluilsc are places of healing and decolonizing for people from all four directions, while creating an opportunity for St’át’imc people to return home to live on the land.